Nao estou conseguindo conectar a um aparelho android que nao esta na mesma rede que eu de uns dias pra ca, alguem sabe me ajudar? I can't connect a device in other Wifi Network only in the same since yesterday. 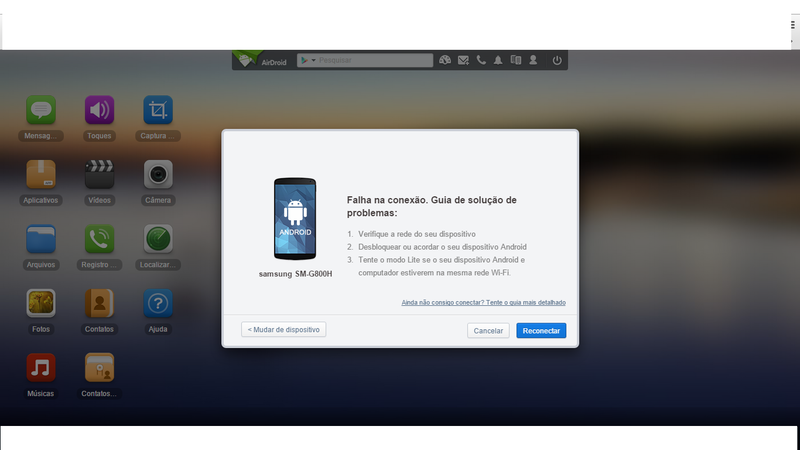 What's the problem with the web.airdroid.com? Hi, can you pls tell us more details of the issue so that we can help you solve it? The steps to reproduce it, any error msg? The network environment, etc. Any error msg? Your phone is connected to the mobile network? And you may try if this helps: [Help & FAQ] Failed to Connect to Device? At 1:00 AM until 8:00 AM back to conect but now is not conect again! Was working well but now is not conecting. At 1:00 AM until 8: AM was connecting.